Hello, my name is Courtney. I enjoy making healthy creations in my kitchen and learning more about nutrition and healthy life style habits. join me on the Journey of eating well! I love smoothies. They’re a great way to pack nutrients into my day. Being pregnant, I’m extra sensitive to my daily nutrient intake…did I eat enough protein, fruit, veggies? The answer, sadly, is commonly no. Especially this pregnancy, I’m chasing around a 10 month old (I know, we’re crazy for being pregnant again so soon!). Since my pregnancies are so close, I’m also running an extra risk of being nutrient deficient because each pregnancy takes so much out of the mom. Needless to say, good nutrition is so important when you’re carrying for a little one. This smoothie is rich, chocolat-ie, and super yummy! It contains 30 grams of protein, tons of calcium, magnesium, vitamin C and so much more! Getting enough protein during pregnancy is vital. Most moms know you need about 70 grams per day. That is a lot for me since my diet is mainly fruits, vegetables, and grains. It is a challenge to get my needed amount. The Whole Journey blog talks about the importance of magnesium, vitamin C, and collagen during your second trimester (this is when the baby’s skin and bones are forming.). Cacao is an excellent source of magnesium, vitamin C, and antioxidants! Raw cacao contains more magnesium and antioxidants than any other food on the planet! Definitely deserving of the title super food. Magnesium is needed for nerve activity and function. Thus adding appropriate amounts to your diet can compliment baby and moms health. Vitamin C is excellent for many things including antioxidant activity, tissue repair, and collagen protection. A benefit to adding raw cacao to your diet, instead of coco, is that cacao, being raw, contains Vitamin C. Heat destroys vitamin C, thus all processed chocolate has zero vitamin C.
Collagen is a vital part of skin, ligament, tendon, blood vessel, and bone growth. As you can imagine, providing your body with good nutrition while pregnant gives your body the necessary tools to support baby’s rapid growth without depleting the mom. So let’s make a smoothie! 1 scoop of high quality protein powder. I used Sunwarrior Classic Protein Chocolate sprouted and fermented brown rice protein. Combine all ingredients in blender and blend together. Serve immediately. Disclaimer: post not intended for medical advice, talk with your doctor before adding supplements to your diet. So it’s been awhile since I’ve posted- I have lots of ideas to try out and post about, I’ve just been busy with a little home renovating and all day nausea…..yes, I’m expecting a baby in the fall! We were super surprised since our first born came just last year! Why not keep the good times rolling? I attempted something simple last night. I’ve been trying to up my protein since it is recommended that I eat 70 grams per day. That is a lot for me, considering I’m not much of a meat eater. So almonds it is! I wanted to try and jazz up these, some what boring nuts in a healthy way. This is one of the more simpler post but still fun and classy. To start, gather ingredients and create assembly line of almonds, chocolate and salt. 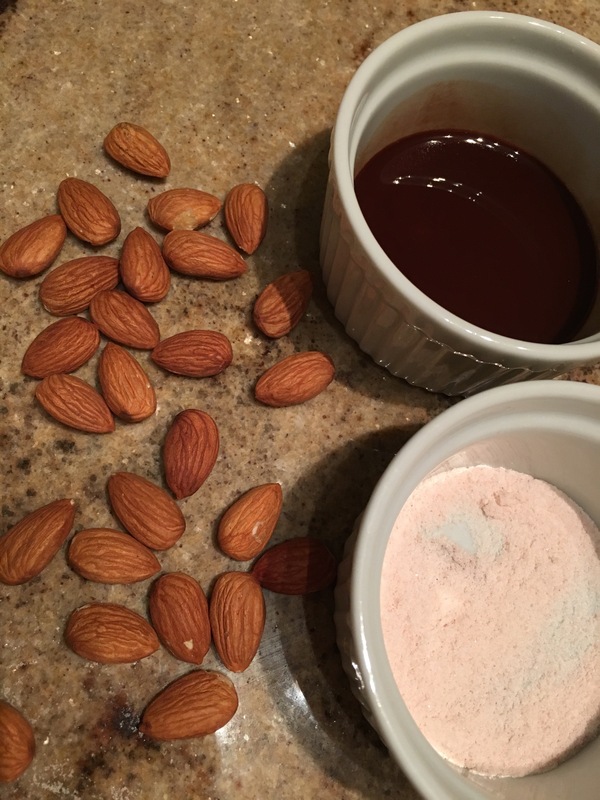 Dip almonds in melted chocolate one at a time and place on parchment paper. Let cool and repeat dipping if chocolate seems to thin. Before completely cool sprinkle almonds with salt. Not only do salt and chocolate go well together they make the almonds look beautiful! Keep in fridge and serve. Okay, I already know what you’re thinking. Homemade chocolate chips? Why would I make something that is so easy to buy? I thought the same thing before I found reasons to make my own. It started with an intolerance to dairy that developed after I was pregnant with my first son. I found non-dairy chocolate chips at a local natural grocery store but, they were double the price of the semi sweet ones I used to get at Trader Joes. It was then that I started doing research and came across some recipes for chocolate chips and thought it would be great to make them sugar free. Another perk about making your own is using all cacao products as opposed to coco. I love adding cacao powder to my hot drinks and smoothies. Cacao, according to the ORAC scale, is the highest antioxidant food that we know of! Anti-cancer and beauty power, yes please! I love finding new ways to add it to my foods. I soon came across a recipe by Forest and Fauna that captured exactly what I wanted to create. I tried this recipe and loved how they turned out. I love the flavor the maple sugar gives it and the soft texture of the chips from the cacao butter and coconut oil. I give Forest and Fauna full credit but, thought I’d share my spin on their recipe. In a medium sauce pan bring about 1/2 cup of water to a boil. Place cacao butter and coconut oil in glass cup and place in sauce pan. Keep glass cup in sauce pan till cacao butter and coconut oil have melted. Once melted mix in cacao powder and maple sugar until completely combined. I first tried using coconut sugar but, that was a mistake because it doesn’t completely dissintergrate. Forest and Fauna had the brilliant idea to let chocolate mixture cool in a silicone trivet, which also works as a mold. Spread chocolate evenly over trivet and place in freezer for about an hour. Since I use coconut oil the mixture is on the softer side, letting it freeze for longer is better. Turn trivet over and work out chocolate chips into a bowl for storage. Store in fridge. Yum Yum Yum!